President Andres Pastrana ended the peace process Wednesday and gave the country's main rebel group until midnight to abandon the vast safe haven he granted them at the beginning of the negotiations. 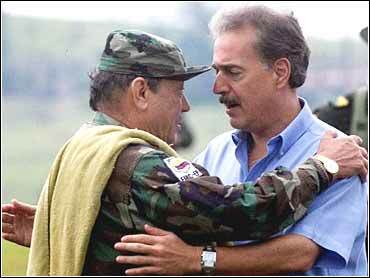 Visibly angered during a nationally televised address, Pastrana said he felt betrayed by the rebels, particularly by Manuel Marulanda, founder and leader of the Revolutionary Armed Forces of Colombia, or FARC. The announcement, which took many by surprise, came hours after rebels hijacked a domestic airliner and kidnapped a senator who was traveling on the flight. The highly organized hijacking angered a nation already fed up with peace talks that have gone nowhere, and appeared to be the last straw for Pastrana. "It's not possible to sign agreements on one side while putting guns to the heads of innocent people on the other," Pastrana said. Pastrana staked his presidency on the peace process, and in his speech insisted that the three-year-long talks had not been wasted. He said the U.S.-backed military was stronger than it had ever been in Colombian history. And he said the process had proved to Colombians that the FARC could not negotiate in good faith. Halfway through the speech, he stopped talking to show video clips of destruction attributed to the rebels: bridges that had been blown up, a homemade bomb in a church, buildings destroyed by explosions, a child's body lying under a sheet. Then he showed aerial photographs that he said were of airstrips and highways the FARC had built inside the Switzerland-sized safe haven in order to further their drug trafficking activities. "Now no one believes in their willingness to reach peace," he said. Wednesday's hijacking came just a month after foreign diplomats managed to save the peace process from its last crisis. During that crisis, the president twice gave the guerrillas 48 hours to make concessions, or abandon their safe haven. This time, he gave them less than three hours, promising to send in troops at midnight. Wednesday morning's hijacking was one of the rebels' most brazen attacks. Four rebels dressed in civilian clothes and armed with handguns forced the Aires airlines flight to make a detour south and land on a two-lane highway. Camouflage-clad rebels met the plane as it landed on a narrow road near the town of Hobo, clipping small trees before it came to a stop. The waiting rebels then whisked away the four armed hijackers and the senator. The fleeing guerrillas blew up a bridge and planted land mines to prevent security forces from chasing them. The remaining 29 passengers and crew of the Aires airlines Dash-8 turboprop were freed unharmed. Rebel leader Andres Paris declined to comment on the hijacking Wednesday evening, saying he wasn't "authorized to give information." There was no immediate comment from the rebels regarding Pastrana's decision to end the peace process. The news was greeted in Bogota by drivers honking their horns. "This peace process didn't make sense because of the actions of the guerrillas," said Jaime Tapia, a shopkeeper in Bogota. "It doesn't matter if there is a war. We are already at war." But the capital and the major cities have largely been spared from the violence that rages in the countryside. "The guerrillas were too strong and the president got tired of it," said taxi driver Fernando Cepeda. He didn't think a wider war would reach as far as Bogota. Colombia's 38-year civil war pits the FARC and a smaller rebel group against government troops and an illegal right-wing paramilitary. Roughly 3,500 people, most of them civilians, die every year in the fighting.